Gutted Mine is a small mine north of Cheydinhal containing vampires (quest-related). It contains only one zone, Gutted Mine. 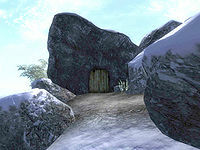 This mine cannot be entered until the related quest is started, as previously the entrance is sealed. The only enemies that you will encounter in this cave are the five Afflicted Brethren that you need to kill for the related quest. The male Orc vampire carries a note identifying the five Brethren by name. This location's map marker (M on map) is named Gutted Mine (editor name GuttedMineMapMarker). The entrance door is SW of the marker, 30 feet away. 1 Oblivion Gate can appear at location O on map. If the Oblivion Gate is present, 1 Daedra will spawn near the entrance to the mine. This zone is quite tricky as it is probable that while fighting in one part the other vampires will become alerted to your presence, especially with the last two vampires, and you could find yourself fighting against up to three enemies. Another annoying feature is that the large wooden sections in the various rooms make it difficult to maneuver and run while fighting. In the first corridor watch out for the swinging mace trap at C and its tripwire at D. Further down the corridor is the first vampire (Q). You then arrive at an intersection. South is a passage that brings you to two minor loot chests; on the way be sure to check the silver veins for nuggets. If you go straight from the intersection (west) you will find the next two vampires, which you will have to deal with together. 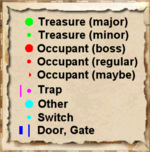 To the north is a small room with a minor loot chest; while entering be careful of the swinging mace trap (C) and its pressure plate (E). To the south are two silver veins. To continue you will have to pull the rope hanging down from the ceiling (cyan dot on the map) that will open the Rock Wall at F. This will let loose the last two vampires, which again you will have to deal with simultaneously. The remaining part of the zone holds two silver veins and the boss coffin (B). To access it you will have to break through the "Loose Planks" (G) by activating them. 2 Swinging Mace traps at location C on map. One is triggered by the Tripwire trigger at D; the other is triggered by the Pressure Plate trigger at E.
There is one door (at Out) in/out of this zone, leading outside. 1 Rock Wall at F. It is opened using the rope hanging to the left of the door (cyan dot on map).